WASHINGTON (CNN) -- The world's population is forecast to hit 7 billion in 2011, the vast majority of its growth coming in developing and, in many cases, the poorest nations, a report released Wednesday said. 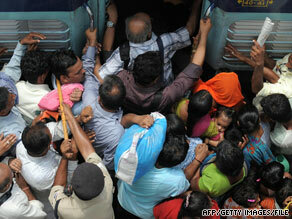 Riders cram into a train last month in New Delhi, India. India's population is expected to be 1.7 billion by 2050. A staggering 97 percent of global growth over the next 40 years will happen in Asia, Africa, Latin America and the Caribbean, according to the Population Reference Bureau's 2009 World Population Data Sheet. "The great bulk of today's 1.2 billion youth -- nearly 90 percent -- are in developing countries," said Carl Haub, a co-author of the report. Eight in 10 of those youth live in Africa and Asia. "During the next few decades, these young people will most likely continue the current trend of moving from rural areas to cities in search of education and training opportunities, gainful employment, and adequate health care," Haub continued, calling it one of the major social questions of the next few decades. In the developed world, the United States and Canada will account for most of the growth -- half from immigration and half from a natural increase in the population -- births minus deaths, according to the report. High fertility rates and a young population base in the developing world will fuel most of the growth, especially in Africa, where women often give birth to six or seven children over a lifetime, the report says. The number is about two in the United States and 1.5 in Canada. A stark contrast can be drawn between Uganda and Canada, which currently have about 34 million and 31 million residents, respectively. By 2050, Canada's population is projected to be 42 million, while Uganda's is expected to soar to 96 million, more than tripling. "Even with declining fertility rates in many countries, world population is still growing at a rapid rate," said Bill Butz, president of the bureau. "The increase from 6 billion to 7 billion is likely to take 12 years, as did the increase from 5 billion to 6 billion. Both events are unprecedented in world history." By 2050, India is projected to be the world's most populous nation at 1.7 billion, overtaking current leader China, which is forecast to hit 1.4 billion. The United States is expected to reach 439 million for No. 3 on the list.